Christina Dambra is a licensed esthetician with several years of experience in dermatology and cosmetology and holds advanced certification in microdermabrasion, lasers and chemical peels. She specializes in holistic health counseling, with expertise in organic skin care and whole food supplementation. Dambra holds a degree in business administration and is a writer for eHow and LIVESTRONG. Calendula, a plant extract, has been used throughout history in skin preparations. Calendula is beneficial for dry or damaged skin and also promotes the fast healing and regeneration of the skin thanks to its anti-inflammatory and antibacterial properties. 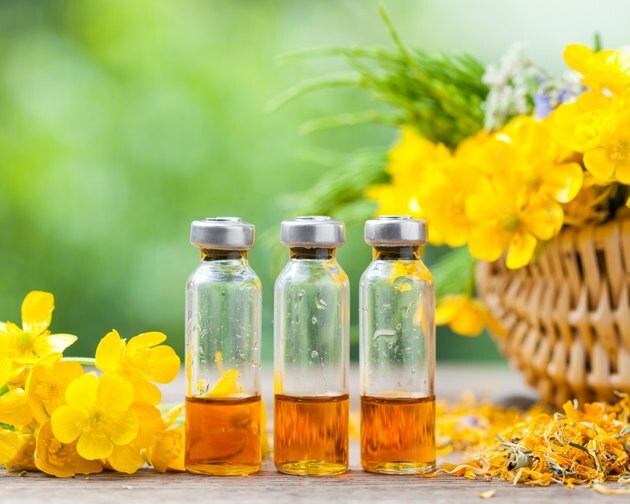 According to YourHealth.com, applying calendula topically may help decrease inflammation and promote the healing of wounds, burns, eczema and other inflammatory skin conditions. Because of calendula's anti-inflammatory and antiseptic properties, it's often used in preparations for sunburns, rashes, insect bites and other mild skin irritations. Calendula treatments can help soothe contact dermatitis from environmental causes. According to WoundsResearch.com, clinical data supports the properties of calendula in topical applications of 2 to 10 percent. Calendula's effect on inflammation and tissue regeneration makes it an effective natural wound healer. Calendula oil is often used for dry or damaged skin. It has natural restorative properties that infuse the skin with a youthful glow. Calendula oil is also used to protect the skin from premature aging and thinning of the skin. Calendula is safe enough to be used on the delicate skin under the eyes to help prevent crow's feet. Creams containing calendula are also used to treat diaper rash. Topical use of calendula can result in a skin rash if you have allergies to marigold or pot marigold. Side effects are rare, and there are no known drug interactions. According to Memorial Sloan Kettering Cancer Center, calendula should be avoided during pregnancy and lactation. Can You Have Allergic Itching From Chamomile Tea?